HAVERHILL, MA -- Brad Estrada, a forward for the Valley Jr. Warriors, has committed to Northland College for the fall of 2019. The '98 native of Chino Hills, CA is in his first season in the Eastern Hockey League (EHL), and he's tallied 19 total points through his first 31 games. 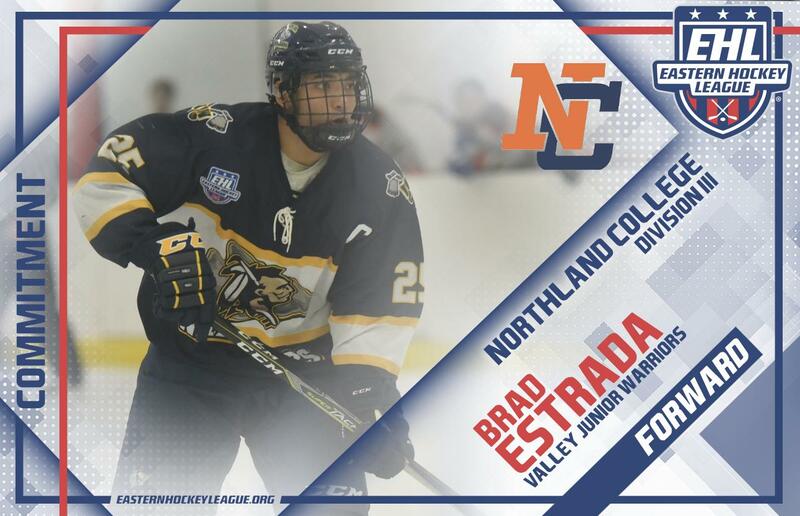 Estrada goes in the books as the 900th NCAA Commitment in league history, and the 6th EHL player to choose Northland College. The veteran forward is beyond grateful to receive this opportunity, and he took some time to offer his thanks to everyone that helped him reach this point in his career. He also spoke to the level of play in the EHL, and how that impacted his ability to reach his ultimate goal. "My time in the EHL has been a great experience and a benefit with gaining interest among colleges," said Estrada. "I can’t thank Coach Andy [Heinze] enough, with the opportunity to play for him and the Warriors. He has given me the opportunity to grow and develop as a player, a leader, and as a young man. The level of play in the EHL is great and I get to play very good players. With having played in over 180 junior A games, my experience has provided me with great memories. My teammates from all my teams have contributed to my success. They were all great guys and I learned a lot from each team. The Warriors have been one of the best group of teammates one could ask for." Estrada went on to give thanks to his closest supporters, his family. Learn more about the Valley Jr. Warriors on the team's official website, and check out the full 2018-19 NCAA commitment list.